Making mac and cheese from scratch used to be intimidating to me. I was positive I was going to mess up the sauce, somehow. Then, I found a mac and cheese recipe in Williams-Sonoma Comfort Food , tried it, and decided I could do this. As long as I keep an eye on the sauce, mac and cheese is actually fun for me to make. Go figure! Warm the milk up in a saucepan, but don't allow it to boil. Pour it into a glass measuring cup. Cook the pasta in a large pot according to directions minus about 2 minutes. The pasta will cook further in the oven. Drain the pasta in a colander. Put the pot back on the stove and melt the butter. Whisk in the flour. Reduce the heat to low and let the flour butter mixture bubble for 1 minute. Don't allow it to brown. Slowly whisk in the warm milk while increasing the heat to medium. I like to pour in about ½ cup at a time. Occasionally I will run a wooden spoon around the edge of the pot to incorporate the flour missed by the whisk. Bring the mixture to a boil while whisking it frequently. Keep an eye on it to prevent it from boiling over. Once the mixture boils and thickens, remove it from the heat and mix in the cheese, salt, and pepper. Try to mix the cheese in as thoroughly as possible. If you have a large chunk of cheese, it will melt in the oven, and show up in the sauce. Add the pasta and mix thoroughly. Pour the entire mixture into an oven proof dish. Bake at 350 degrees for 20 minutes or until the sauce is bubbling. Hooray! 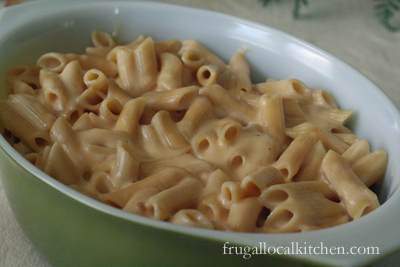 This is the first and favorite way I make mac-n-cheese. The French call that first concoction (the one with the butter and flour where you gradually add the milk) a “roux.” I learned it from my French and Belgian relatives, and you can use the same basic process to make all kinds of cream sauces. Go wild! Make all kinds of pastas, by subbing in Parmesan and adding sauteed mushrooms, etc. Lots of possibilities. I had a feeling I could do something with the roux. Believe it or not, I’ve cooked for a long time only making a tomato sauce. My dh is the fancy cook who has all the sauces down from watching the cooking shows on PBS. I’ll definitely go wild now that I’ve got the sauce down! It is great that you linked this in as well to Food on Friday. Have a super week.